The use of masks in Drama Therapy is both protective and liberating. Mask work will help identify and address the intrapersonal struggle you experience between your inner, critical voice and your healthy, truer self. Your Inner Voice could be . . .
Is Mask Therapy for You? 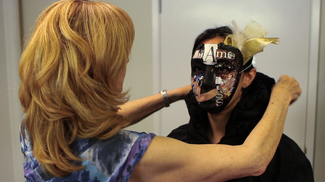 In my workshop, you will create your own masks which reflect your inner conflict. By then wearing your mask and acting out loud as your Inner Voice, you will start to understand how this voice became part of you. By embodying and verbalizing this voice through my interview process, it will be exposed and witnessed by me and others in your Mask Therapy Group. Bearing witness builds your trust. Within the safety of this trust, change, healing and growth can happen. You will soon realize that you are more than the voice of this mask and through the process, rediscover a healthier perspective that has been lost along the way. This is when you will create a mask of your Compassionate / Healthy Self. Through this externalizing process a space is created in which a different dialogue can occur and this facilitates integration and the beginning of a different relationship with yourself. You are now on the path to change.